La Chinoise is a 1967 film made by Jean-Luc Godard at the beginning of his political phase. It is commonly considered a classic because of its apparent prophetic nature since it is supposed to have predicted the May 1968 student revolt in Paris. It is commonly, and too easily, dismissed as socialist propaganda, ineffective because of the near incomprehension of its artistic sensibilities. There is no real plot, the film jumps between dramatic scenes, political speeches, intertitles, images and a variety of Brechtian devices intended to confuse the audience, force them out of their comfort zone of passive watching and actually engage with the film’s debate. 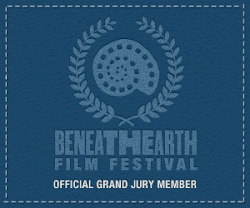 Hence the key line comes at the beginning: “A film in the making.” As much as this may suggest that the film is an improvisation – Godard was never one for extensive planning – it also suggest that the film begins on screen but finishes inside the active viewer’s mind, where opinions are formed and the film’s message is finally chosen. In this sense, the second key line in the film comes later, in a speech by Kirilov (Lex de Bruijn): “We demand the unity of politics and art. The unity of content and form…Works lacking artistic value, no matter how politically advanced are ineffective. In literature and in art we must fight on two fronts.” Here, Godard explains his methodology – a political film is only effective if it marries its message with revolutionary aesthetics. A truly political film is a film that cannot be used by the marketplace dominated by Hollywood, which promotes passivity and uncritical identification. The ways of viewing a political film must be different from the ways of viewing Hollywood films - later Godard would reject the means of production and exhibition of mainstream cinema entirely, making esoteric, homemade films on video. As an example of a political film usurped by Hollywood, Godard would point to the acclaimed The Battle of Algiers – a fantastic faux-documentary about the Algerian war, which shows the violence on both sides. Though the film is certainly educational, the viewer might leave without their opinions changed, much less radically altered, since the film can be viewed, or consumed, just like any other less politically-orientated Hollywood blockbuster. A more recent example might be Tarantino’s latest, Django Unchained. Though Tarantino uses the horrors of slavery as a backdrop, the audience will get less of an impression of the evil of slavery, their outrage softened by a busy plot, likable characters and a happy ending. The reason this introduction is so long is because La Chinoise is the kind of film that needs to be approached with an awareness of certain ideas already in place. A viewer must be ready for the film in a way that they don’t have to prepare for a Hollywood blockbuster – which, too often, you don’t even have to pay attention to. It is not really an emotional film; any thrills one might get from it are purely those of ideas. Similarly, the film does not provide any answers, instead insisting that one comes up with one’s own. The viewer has to engage with the film, actively watch and deconstruct and think about the film. The joy of La Chinoise, or any film like it, and possibly the reason why some many would dismiss it, claiming incomprehension, is that it is a film that is alive with invention. Godard’s love of the medium comes through via the range of aesthetic devices that he includes, but also because of his willingness to question our very definition of what constitutes a film. To dismiss La Chinoise as mere propaganda, as a result, is to deny that film can be more than what Hollywood thinks it should be. La Chinoise takes its slight plot from Dostoevsky’s fantastic novel “Demons”, in which five amateur revolutionaries fill themselves with political dogma, chose an enemy and murder him. 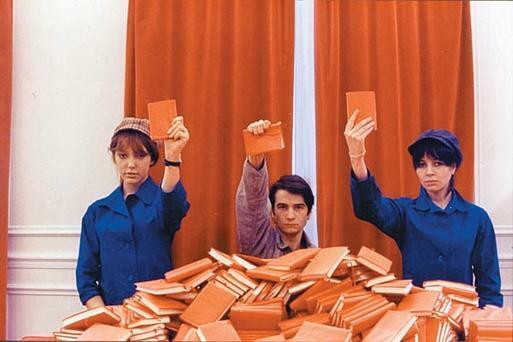 Dostoevsky’s target was the growing idea of nihilism; Godard’s, tackled much more ambiguously, is Maoism, best represented by Mao Tse-tung’s “Little Red Book.” La Chinoise follows five students, lead by Veronique (Anne Wiazemsky, then Godard’s wife), as they live in an empty apartment during the summer holidays, trying to apply Maoist teachings to their lives and possibly create the conditions to start a revolution. The film is divided into three movements. The first deals with the education of the students, showing them reading, attending lectures and being interviewed by Godard himself on their beliefs. The second movement is the shortest and deals with arguments about the applications of the theory that the students have now taken on board. Some advocate a new form of political art – providing the film’s manifesto – whilst others speak of the need for violence. The final movement is, hence, their plan of action once terrorist activity is decided upon. As a film about left-wing terrorism, La Chinoise is seem rather sinister, or at least highly naïve, to some. However, Godard is a lot less didactic as he may initially appear. He is open to all of the divergent opinions within the group and can even be quite critical. Early in the film, we hear Veronique reciting some political dictum to the amusement of her boyfriend Guillaume (Jean Pierre Léaud, the child actor from The 400 Blows) – his later extremism suggesting a form of indoctrination or, simply, insincerity. Perhaps. Godard does not wish to make anything too easy for his audience, preferring instead that they listen to each of the characters as they present their arguments, then decide for themselves. The most sympathetic character is Henri (Michel Semeniako), but then he is the least hard-line and the one who promotes peaceful co-existence. He is called a reactionary and expelled from the group. Yvonne (Juliet Berto) is the working class member of the group and, despite the group’s supposed socialist values, she is frequently seen tidying up around them. We also frequently see her education – or, if you want, indoctrination - Berto’s performance moving from wide-eyed innocence to unblinking devotion to the cause. Most ambiguous of all, and possibly the best scene in the film, is Veronique’s encounter with Francis Jeanson, a real-life revolutionary. They meet on a train and discuss her right to commit terrorist acts, Godard filming the conversation from a fixed position, the frame balanced between Veronique and Jeanson – in other words, neutral. Here, Godard’s key desire comes to fruition. We sit and listen to the points being made by both characters, without sympathetic or biased editing or camerawork, and then, at its conclusion, make up our own minds. La Chinoise is very much a true essay film, with imagery and text inserted into the onscreen action just as one would place a citation in a thesis. It is politically charged cinema, thoroughly in love with dialectical thinking and committed to engaging with an audience. La Chinoise does not wish to educate, or even convince; it merely wishes to communicate. Its key flaw may be that it is too daunting for most viewers, especially now that it is somewhat dated, but it remains a unique form of cinema that cannot be ignored by anyone who is truly interested in what cinema can do.